During the campaign, Romney’s explanation for his ugly comments was that “now and then you’re gonna say something that doesn’t come out right” when you do hundreds of speeches and Q&A’s. And, in fairness, it does look like he’s refined his bitter rich-guy spiel since that notorious Boca Raton fundraiser. 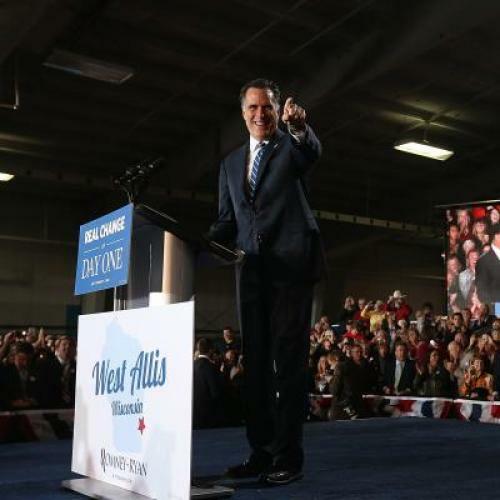 Back then, Romney complained that the 47 percent “believe that they are victims” and “that they are entitled” to government goodies like health care and housing. This time, Romney oh-so-deftly expunged any talk of victimhood or entitlement (at least so far as we know). In this new rendition, the people who voted against him just happened to be on the receiving end of a government spending spree worth “trillions of dollars,” through no particular fault of their own. What were they going to do—turn it down? Let it not be said that Romney doesn’t learn from his mistakes. On the off-chance this nonsense still needs rebutting, let’s be very clear: There are plenty of reliable Republicans who get heaping piles of government goodies, as my colleague Jonathan Cohn has explained: seniors who love their Medicare, veterans who depend on VA benefits, corporations that gorge on lavish subsidies. Believe it or not, there are even wealthy financiers out there who don’t pay income taxes on their loot and who deduct the mortgage interest on their vacation homes. (Not that I have anyone specific in mind.) Cohn points out that Romney himself promised an exceedingly large “gift” to elderly Republican voters: restoring $718 billion worth of savings from Medicare that Obama had achieved through the Affordable Care Act. The question we all debated when Romney delivered his original monologue on distributional justice was whether he genuinely believed it, or whether he was simply telling conservatives and the aggrieved rich what they wanted to hear. Many argued that Romney must have been speaking from the heart because he assumed his comments would stay private. There was no reason to lie. Others—myself included—posited that no one, not even the chronically oblivious GOP nominee, could labor under the assumption that something he told a few hundred people would stay under wraps. Romney must have been pandering to conservatives; it just happened to be a singularly cartoonish and ham-handed attempt. Of course, the second interpretation didn’t make Romney’s disquisition any more excusable (arguably less so). But it did hold out some small chance that a Romney presidency wouldn’t be as objectionable as the comments suggested. On one level, we still can’t say for sure whether or not Romney believes this stuff deep down. (Though Jon Chait makes a good case that he must.) His audience for this latest trip to the makers-and-takers well included the same alienated plutocrats whose pain he felt in South Florida. It’s possible that he has a reflex for grossly incompetent pandering he just can’t suppress. But on another level, if your moral sense is so attenuated you’re able to spout the same vile pabulum even after it’s been thoroughly debunked by the media, even after you went to great rhetorical lengths to distance yourself from it, even after it arguably cost you a presidential election, then it’s safe to say it's what you stand for in every practical and moral sense. There are no more distinctions for any remotely serious person to parse, if there ever were any.